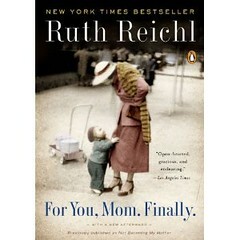 Former editor and chief of Gourmet Magazine and restaurant critic for both the New York and LA Times – Ruth Reichl has done it again with her book, For You Mom. Finally. As any woman knows, there are few things in life less complicated than a relationship between a mother and daughter. Ruth captures this complexity with her own story of learning about her own mother’s life and unrealized dreams. A quick read at just over 100 pages, this book inspires looking beyond how you have always thought of your mother and to look a little deeper into the woman she really is – just in time for Mother’s Day. I just can’t wait to see what Ruth will honor us with next! Are You Afraid of the Dark . . . Spirits? Braiden Rex-Johnson is not only a fantastic food writer and author, but also a dear friend. Her latest venture brushes upon a very touching topic that affects us all. Braiden’s website allows the audience to submit their most cherished stories as well as pictures of their deceased loved ones to be honored and shared. FiveMoreMinutesWith.com was inspired by the deaths of three family members within one year, and the death of our beloved companion animal, Bo-Bo the cat, the year before and never having the time (or taking the time) to mourn them properly. As a long-time food-and-wine writer, it seems only natural that the inspiration for FiveMoreMinutesWith.com came about over dinner and a bottle of wine at a favorite French bistro. The premise for my new venture is actually a provocative question: What would you say to a departed loved one if you had five more minutes to spend with them? From the New Orleans inspired dining room, to the seemingly endless pages of menu, I am surely not the first to say there is nothing petit about Queen Anne’s new dining destination. It’s a little dark, has high ceilings and resonates an antebellum décor, reminiscent to the large open dining rooms prevalent in the south, where fans hang gingerly from the ceiling. The floor to ceiling windows gives the space a warm feel without being cavernous. However, Table 13 is cursed by a timed street light that flashes on and off throughout your meal; it helped in reading the menu but in frustrating intervals. Our cocktails were fabulous, a perfect balance of fruit – without being overly sweet. I tasted the ‘Madame Toulouse’ and the ‘Bitter Love’, both of which I loved. On a separate occasion when they were out of the Campari for my cocktail all I said was, “I’ll take gin, a little fruity and not too sweet.” What was offered up was a refreshingly light cocktail that I would just as easily order again. The best seats in the house are the booths along the bar. They’re the best choice for room watching with friends while filling your bellies with any number of dishes from the huge menu of seafood, soups and to the house-made charcuterie. Honestly, they could easily cut the menu in half and still have me salivating over pork parks and shrimp dishes. But how are the dishes… ? Plan on trying a few dishes, and go with some hungry adventurous friends. While the atmosphere is dark and romantic, you’d be better served to bring other hungry mouths. Try the house charcuterie, and of course the spicy alligator. I got a couple of chewy pieces in the mix but overall it’s a fun plate and quite tasty. If you’re going to stick to small plates and appetizers, don’t forget the sides. The creamy parmesan corn grits are deep sign provoking in its deliciousness, and the cauliflower gratin with gruyere and horseradish comes to the table a mammoth bubbling mass of perfectly cooked cauliflower drenched in musky gruyere and tart horseradish. We had to send ours back to the kitchen for a reheat in the center but at the end of the day our server did it with a smile and in a few moments we were back at the bubbly plate of veggies. It’s a rich menu; even the salad doesn’t skimp on the rich creamy stilton. Overall, it’s not going to break the bank: happy hour is always a great deal and brunch is a steal. During the week from 9am to 11am everything on the breakfast menu is 6 bucks!! Personally I’m fond of industry night on Sunday night and Monday morning, with food and drink specials with your favorite bartenders, cooks and service staff. That’s a deal I can get behind. Local ingredients, classic pairings and a flourish of daring new flavors highlight the menu prepared by featured Northwest chefs for the annual Premier Chefs Dinner benefiting the Fred Hutchinson Cancer Research Center. Crudo (an Italian version of sushi), a savory duck “leg and egg” combo and Kurobuta pork belly are only some of the tasty dishes for this extravagant five-course dinner held at 5 p.m. Sunday, May 16 at the W Seattle. Reception, dinner and a live auction includes glasses of wine from Dusted Valley Vintners and Walla Walla Vintners amongst many others. Tickets are $250 per person, with all the proceeds going to the Fred Hutchinson Cancer Research Center. More information is available here. Clam-Tastic Times at the Razor Clam Festival!! The Ocean Shores’ 4th Annual Razor Clam Festival was clam-tastic! We headed out early to meet up with local Ocean Shores TV hosts. We shot episodes of Discovering Food and Wine with Leedia Bailey and Cooking with Dale. 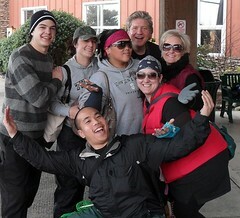 Then it was off to the festival kick off VIP Party at the Quinault Beach Resort & Casino. (which by the way is a fantastic place to stay!) I got to meet and chat with some great razor clam enthusiasts, nibble on some great apps prepared by the hotel, and sign some copies of Sips & Apps. Following the VIP was the clam dinner and dance and the coronation of this year’s Razor Clam King and Queen! 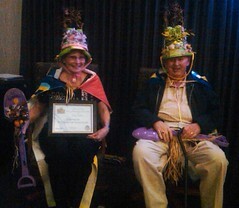 The Razor Clam Queen and King in their royal garb! Too Funny! The next day was the big day! Held at the Ocean Shores Convention Center, the day started off with a firemen’s all-you-can-eat pancake breakfast! There was lots of booths set-up for hand crafted gifts, baked goods, local restaurants dishing out samples of clam chowder and other goodies, and some fantastic live music. 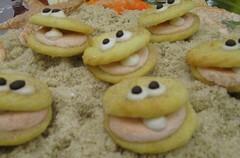 Here’s a photo of “Butter Clam” Cookies from Suzie’s Cakes! Then we got down to tasty business – the clam chowder cook-off! Entrees were judged upon taste, texture, appearance and smell. 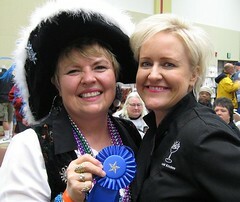 The competition was tough – there were so many tasty chowders! Heather, Cameo and Travis from Kathy Casey Food Studios sampling one of over 29 clam chowders! After careful deliberation amongst the judges, the winners were chosen. Amateur Category : 1st place Dee Dee Bass, 2nd place Don Toon, 3rd place Jeffery Huffman. Professional Winners: 1st place Front Street Café at Seabrook, 2nd place Alec’s by the Sea, 3rd place Quinault Beach Resort & Casino. Congratualtions to all the winners!! Dee Dee Bass and me! Then we were off to the best part of the day – razor clam digging! My Crazy Clam-Tastic Crew Dressed in Beach Gear! And maybe it was a once in a lifetime thing but it was sunny and almost kind of warm on the ocean beach! We dug and we dug……….and we danced ! Yes, after digging our clams we decided to make up an official Razor Clam Dance – stay tuned for the YouTube video! After a great day hosting razor clam fest, digging clams, meeting new friends and dancing on the beach – we hit the sack. Then early the next day, we headed out for one last feast before the drive back to Seattle. We started our Sunday with a beautiful brunch at the Collins Inn – wow what a cute place and brunch was fantastic. We started with pastries, fresh fruits and then on to d’lish entrees: smoked salmon Benedict, seafood frittatas, waffles and more! Today we are back at the Food Studios and shooting a video on how to clean razor clams. 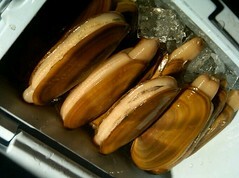 We rinsed our clams at Ocean Shores and then put them in our ice chests to chill out till we headed home. A lot of the motels have “clam cleaning” stations but we opted to wait till we got home. Cleaning the clams is a bit tricky if you haven’t done it before—and online instructions are a bit vague. When we clean our clams we also save the shells, boil them to get any gook off and then clean them well. Next, we soak them in water with a tiny touch of bleach to get any remaining smell out. We then dry the shells to use for garnishing and/or as a serving vessel for sashimi that we will make out of the clam necks. Though many government sites recommend not eating clams raw, I like to take the tougher neck part of the clam and slice it in lengthwise strips; sometimes I even lightly pound this part of the clam. We enjoy the tougher neck portions sliced paper thin on a bias and eat it sashimi style with a little ponzu and soy – a lovely presentation served in the cleaned shells. The “belly part” of the clam we keep separate from the body part for other great clam dishes. I’m disappointed to find a plethora of RITZ cracker breaded clam preparations and heavy breaded variations. Though a light dip in egg and panko or cracker crumbs is a tasty classic preparation – we all wanted to try something more clamtastic with our clam bounty. So after a couple of impromptu dinner parties at Scott and Darwin’s we came up with a quick and easy and delicious clam fritter recipe. Yes, they are fried – but we do it hot and quickly so they are not greasy at all! Served up with what Scott calls my “Rock the World Tarter Sauce” – the recipe is a classic with a modern update! And for a lighter Razor Clam dish try whipping up my recipe for Razor Clams with Lemon Grass. I like to serve this dish with steamed jasmine rice. If you like it spicier serve red chili paste such as Sambal Oelek on the side… just be sure you don’t use too much and cover up the delicate flavor of the sweet clam. Cut clam neck and body into strips and cut belly’s into 2 pieces. Set aside. In a medium bowl mix together Pacific Rim Herb Paste. Toss clams in mixture. Set aside. Heat oil in a large non-stick pan over medium –high heat. When pan is hot add belly’s first – cook for about 1 minute then turn over and add clam strips, onions and peppers. Cook for about 1 more minute. Add fish sauce and coconut milk. Cook for about 1/2 – 1 minute more until hot. Serve immediately with fresh lime squeezed over dish and a sprinkling of fresh cilantro. The Easter baskets are unwrapped the eggs all found (we hope!) and what do you do with all those chocolate bunnies, jelly beans, Peeps and colorful hard boiled eggs after the hunt? Well we thought long and hard and have come up with some fun ideas. 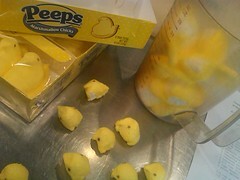 Peep & Jelly-Bean Rice Crispy Tweeps are oooh so cute garnished with tiny peep heads – they are the perfect thing to whip up with post-holiday candy. 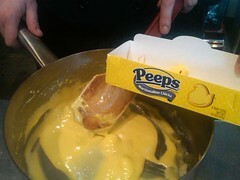 Melting the Peeps into gooey goodness! And for the adults, steal a few of the kids chocolate bunnies when they are all in a sugar coma and stir yourself up some Bunny’Licious Chocolate Mocha Fondue using a splash of your favorite liquor (kid-friendly without the liquor too – but hey they have already had their treats!). Serve with an assortment of fruits for dipping or some of those Peeps. And one of my most fav’s is the Oatmeal Jelly-Bean Cookies. Inspired by cookies my Mom used to make when I was little with cut up gumdrops … they are d’lish! 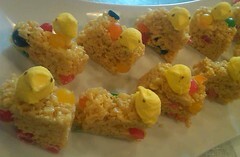 Peep & Jelly-Bean Rice Crispy Tweeps hopping around the plate! Now on to all those hard boiled eggs….. The eggs have been boiled, decorated, dyed, hid, found… now what to do with the plethora of eggs? Well of course there is egg salad sandwiches – but I’ve added a little curry twist with my Springtime Curried Egg Salad Sandwiches – and a tasty garnish of thin sliced radish and cucumber – very springy! 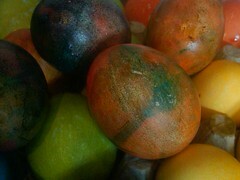 Some of the tie-dye eggs that I found while egg hunting! Now on to deviled eggs, the other go-to for using up your eggs. Bloody Mary Deviled Eggs – inspired with horseradish, Worcestershire sauce, Tabasco, and a “garnishy ” topping made of minced tomato, celery, stuffed green olives, and a splash of vodka. Wow! They just may be the perfect breakfast… or dinner starter for your Spring holiday feast. So I hope you enjoy my “use up the Easter booty” recipes and cook up some springtime fun! My mom has made these cookies ever since I can remember but she used cut up gumdrops in them. Jelly beans taste just as great! Cream butter, sugars, eggs and vanilla. Sift together dry ingredients and blend in. Mix in oatmeal, jelly beans, walnuts and raisins. Chill 30 minutes, then drop by tablespoonfuls on a greased baking sheet. Bake about 14-16 minutes or until golden. Chop hard-boiled eggs to nice 1/4-inch pieces, good for making the egg salad. In a bowl, mix chopped eggs with green onion, red onion, celery, and curry powder until evenly distributed. Mix in mayonnaise gently but thoroughly. Sprinkle with salt and pepper and mix thoroughly. Divide and spread the egg salad evenly among 4 slices of the bread. Layer on the lettuce and cucumber and radish slices, dividing evenly, and close the sandwiches. Use the kids eggs… but keep these for the adults! These are also great with the addition of celery bitters in the egg mixture or finished with a dash of celery salt too! Cut the eggs in half lengthwise and transfer the yolks to a bowl. Set the egg white halves on a platter, cover, and refrigerate. Spoon the mixture into a pastry bag fitted with a plain or large star tip, then squeeze (pipe) the mixture evenly into the egg white halves. To make the topping, mix the tomatoes, celery, olives, lemon juice, and vodka in a small bowl. Top each egg half with about 1 teaspoon of the mixture, then garnish each with a tiny celery sprig.